When I was asked to write a post about cooking with Flora I hesitated for a moment. I don’t actually bake very often and although I do keep a tub of Flora Pro.Activ Buttery in the fridge, that has more to do with having raised cholesterol levels. Swapping Pro.Activ for butter helps assuage the guilt when I indulge in a hot cross bun or a Jacket Potato. It’s a simple change that I’m hoping will help me avoid having to take medication – the plant sterols in the Pro.Activ are known to reduce ‘bad’ cholesterol levels. Anyway – to cut a long story short I had a whim to make cookies. 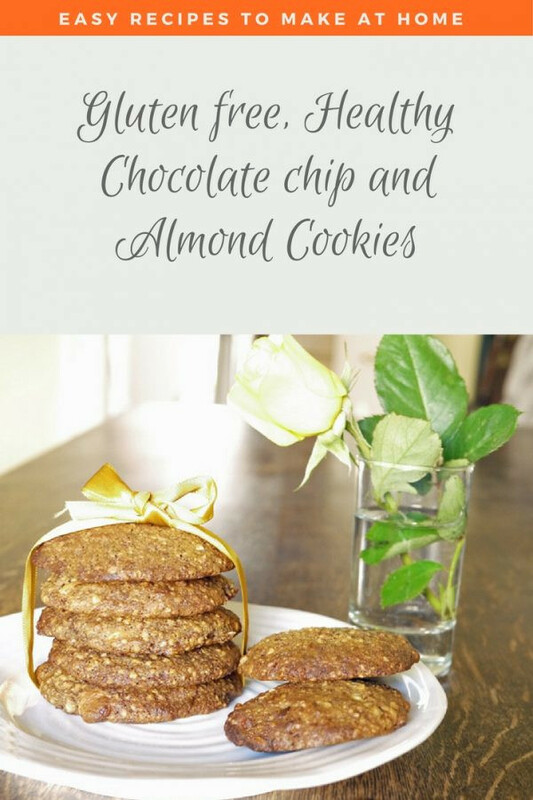 And, I was intrigued by the idea of ‘healthy’, so when I found this recipe for Almond Flour and Chocolate Chip cookies I thought I’d see if I could make a version using ingredients I could get hold of easily and know that I like. I love Billington’s Molasses Sugar. I can actually eat it by the teaspoonful – while that MIGHT be healthier than eating refined white sugar I am sure it’s not really very good for me! If you want those pretty pale almond coloured cookies, then try using light soft brown sugar and blanched almonds instead. I also wanted to make a little cookie stack and tie it up with ribbon. It would help the shot a lot if I could tie a tidy bow…but I still rather like my little cookie picture. Even though I don’t really do food styling. I made my own almond meal by blitzing whole almonds with skins on. And, I used Flora Buttery to make the initial blending really quick and easy. Although I do have a stand mixer, taking it out to make a relatively small bake seems like hard work for me and if I can get a great result using a product like Flora Buttery that is soft from the fridge, I’m more than happy to do that. 90 g Almonds pulsed in a food processor till you have ground almonds. 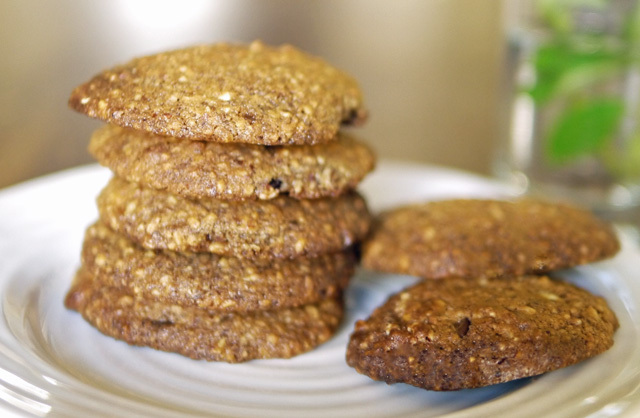 You don't need to blanch the almonds unless you want perfectly pale cookies! Line a large baking tray with silicone paper. Drop dessertspoon blobs of the cookie mixture onto the tray, spacing them out with at least two inches between each cookie. You are aiming for 10 to 12 cookies. If necessary bake in batches or use two trays ! Bake in the oven for 10 minutes or till the edges darken slightly. I’ve discovered these freeze very well. If they were just in the biscuit tin I’d feel obliged to eat them all at once. But, now I can take one zap it for 20 seconds in the microwave – and it tastes just as good as it did when first baked. For a small household without a gaggle of hungry children to feed it is really important to find things to bake which can be frozen in ‘single’ portions. Brownies and muffins are great – and these cookies are now on my ‘can make safely’ list – treats that can be taken out when I fancy a little indulgence. 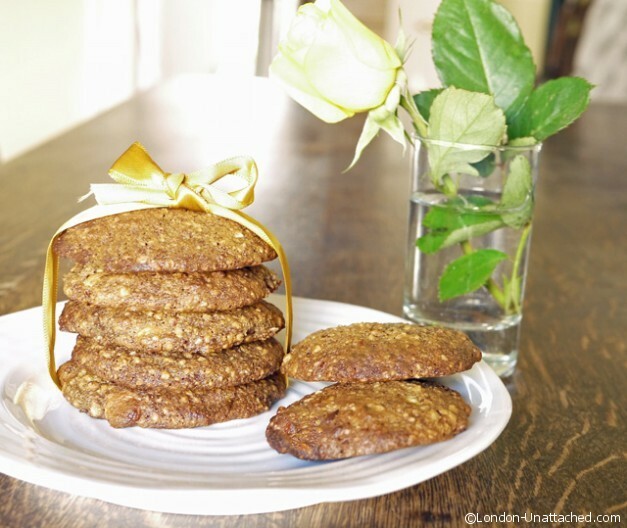 These are soft cookies – they have a slightly soft centre with a crispy ‘shell’. 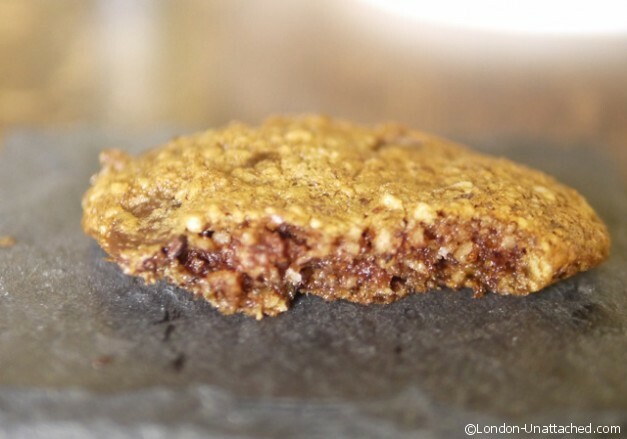 Gluten free, they taste wonderfully nutty to me with a lovely buttery flavour. I’m not entirely sure they are ‘healthy’ but, I think I’m going to avoid trying to find out too much about the nutritional value and just enjoy one for a treat every so often. Disclaimer: This post was commissioned by Flora. They look lovely. I made a tasty cake the other day with ground almonds, I love them. They look really gorgeous – and great that they are glutenfree. Love the recipe and it’s very useful to know about the plant sterols in the Flora Pro.Activ Buttery. Yummy! These look like absolute heaven! These sound amazing. I can’t wait to try them myself. Wow! These sound great! must try them! Yum love making cookies, will try this!